Bernarda Viteri, MD, is an attending physician with the Division of Nephrology at Children's Hospital of Philadelphia. 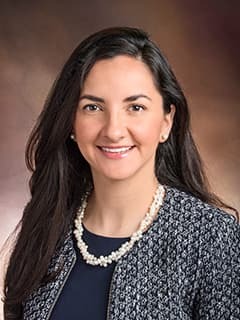 Bernarda Viteri, MD, is an attending physician in the Division of Nephrology at Children’s Hospital of Philadelphia (CHOP), and Clinical Instructor at the Perelman School of Medicine at the University of Pennsylvania. Originally from Ecuador, Dr. Viteri completed her undergraduate and medical degrees in a six-year combined program at the Universidad San Francisco de Quito, where she graduated at the top of her class. She moved to the United States in 2008 and started working in pediatric urology research at Children’s National Medical Center in Washington, D.C. She conducted research for two years in various roles leading up to co-investigator, where she developed interest in kidney imaging research. Dr. Viteri completed her pediatric training at Maimonides Medical Center in Brooklyn, NY, obtaining an “Advocacy Annual Award” for her work in rural communities in Ecuador. She completed her pediatric nephrology sub-specialization at the Icahn School of Medicine at Mount Sinai, where she pioneered an imaging track and became a Co-Director of the Renal Imaging webinar sponsored by the American Society of Pediatric Nephrology. As a pediatric nephrologist with interest in renal imaging biomarkers, Dr. Viteri is working with the radiology, urology and transplant teams at CHOP on different renal imaging modalities to improve diagnostic tools and develop different predictive models utilizing quantitative imaging analysis to improve the care of children, all while pursuing a Master of Science in Translational Research at the Perelman School of Medicine at the University of Pennsylvania. Viteri B, Reid-Adam J. Hematuria and Proteinuria in Children. Pediatr Rev. 2018 Dec;39(12):573-587. doi: 10.1542/pir.2017-0300.